The country is in the grips of significant snowfall. The so called ‘Beast from the East’ has dominated the news and weather headlines for days. Flights, trains and other transport services are cancelled, hundreds of schools remain closed and people in general are being advised not to travel unless absolutely necessary. As a consequence bin collections across many counties have also been suspended leaving householders unsure of when their rubbish may be next picked up. Bad weather continues and travel and public service misery is compounded. Here is what we recommend in the event of suspended waste services in Hertfordshire, Bedfordshire, Buckinghamshire and other areas. Don’t panic! OK, we understand you’re probably not panicking just yet but we understand how frustration disruption to bin collections can be. If your bin collection is due or overdue leave your bin out ready for collection and usually on the next available day it should be collected, weather permitting. Bag up extra waste – as waste builds in the absence of a bin collection just continue to collect waste as normal and bag up what you can. If you have run out of room in your bin the chances are that the council will accept additional waste in the short term to make up for the weather delays. 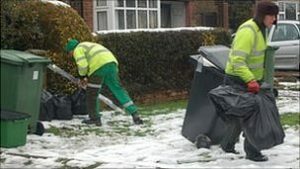 Make other arrangements – if the icy weather continues or the council closest to you doesn’t make up the back log of waste you may want to consider contacting private waste clearance services or make plans to remove the excess waste yourself. Local firms may be able to respond quicker than council services and could be more convenient than waiting. Book specialist waste services – if you’ve taken the opportunity to have an early spring clean with the unexpected ‘snow days’ then you may have extra waste to clear. Electrical items, excess timber and unwanted furniture may be removed by private services or specialist companies. Contacting a local company could give you the best options for getting rid of spring waste quickly. Ensure that they have the appropriate waste carrier’s license for removing your items. We would be happy to help anyone in the Hertfordshire, Buckinghamshire and Bedfordshire areas struggling to get their ‘snow’ waste or excess waste picked up. We can also assist with ad hoc requests and ongoing waste removal contracts.